So Im sure a lot of you have read the post regarding the pregnant female I rescued from the pet store. For those of you that havent, heres the short story. Local pet shop incorrectly sexed a litter, left a female with her brothers for roughly 2 months (they dont know when the litter was born, even though they breed their own mice), I went in to grab some chews and they asked me to take her, since they had no room for her and were going to leave her in with the males. I snatched her and she, her babies, nor myself will ever be going back. Now that everyone is up to speed on that: I have been spending a lot of time with her since she came to me, in the hopes that she will trust me by the time the babies are born. The progress on that has been FANTASTIC, she is always ready to come hang out, and doesnt try to run away or anything. I think she knows I took her from a horrible situation. Today though, while I was getting my "hourly mousey kisses" as my boyfriend calls it, (she loves holding on to my nose and licking the end of my nose) I noticed a big difference between her and my other mice (even my long haired mice). She has insanely long whiskers. They are almost as long as she is! Now that Ive noticed it, Im seeing that she frequently steps on them, has them in the way, etc. 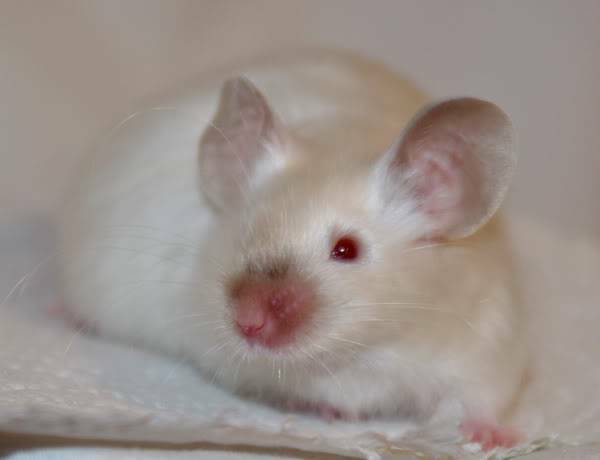 Does anyone else have mice with whiskers this crazy? They also have a slight curl-Does this mean she could possibly being carrying rex and angora? I know the two genes, expressed, would make a texel, which she definitely isnt. She doesnt appear to be carrying rex by looking at her coat, and I guess you could call her a very poor angora. She has fluffy fur that is a touch longer than normal, but she is nothing compared to my better bred long hairs. Any thoughts on these whiskers? Sorry the pictures arent great; On top of having a not so awesome camera, its hard to photograph for whiskers! Her longer whiskers go back as far as her hind legs. Rhasputin, do you know if these whiskers say anything about her genetics? The long whiskers are because she's an Angora. Im just shocked, shes the worst bred mouse I have, her coat isnt very good. My 2 well bred angoras with awesome coats have whiskers no where near this size. Some of my better angoras have supper whiskers too. Here is picture of one that shows it pretty good. He's only technically half angora (angora carrier). Aw, she is really cute!